Parents are often disappointed or even a little bit upset when I tell them there’s no medicine to help their coughing, sneezing, drippy-nosed children feel better. There’s nothing that works, I say, and medicines can have bad side effects. We don’t recommend any of the cough and cold medications for children under six. But after all, parents are intimately aware of just how miserable a cough and runny nose and congestion can make a small child feel, from cranky days to disruptive nights. And often there is something both comforting and familiar about those over-the-counter medicines, which figure in many parents’ memories of their own sick days way back when. “They all took these medications themselves; there’s a comfort in knowing that,” said Dr Ian Paul, a professor of paediatrics at Penn State College of Medicine. “Parents are always worried that something bad is happening and they have to do something,” said Dr Mieke van Driel, who is a professor of general practice and head of the primary care clinical unit at the University of Queensland in Australia and the lead author of the study. As a primary care physician herself, she said, she is well aware of the urgency that parents feel to find something that will relieve their children’s distress. In addition to understanding that there is no evidence that these medications help, Van Driel said, parents need to understand that there are clear risks in using them in young children. The Food and Drug Administration originally recommended against any over-the-counter cough and cold preparations in children under two; the American Academy of Pediatrics has extended the recommendation to apply to all children up to six. And after manufacturers voluntarily withdrew products marketed for infants, and changed labels to recommend against use in young children, researchers found a drop in children coming to emergency rooms for problems with these medicines, which in past studies ranged from hallucinations to cardiac arrhythmias to depressed level of consciousness. When it comes to the sniffles or the cough associated with the common cold, “these symptoms are self-limited,” said Dr Shonna Yin, an associate professor of paediatrics and population health at the New York University School of Medicine. Parents can help comfort their children without giving medications, she said, offering plenty of fluids to keep children well hydrated, and honey for a cough in children over a year old (no honey for babies under a year because of the risk of botulism). Other measures may include ibuprofen or acetaminophen for fever and saline nose drops for congestion. “Our 2007 study was the first to show that honey was more effective than dextromethorphan” — a common cough suppressant — “or no treatment,” Paul said. Since then, other studies have shown that honey does relieve cough, and the accompanying sleep disturbance. Organic agave nectar, on the other hand, had only a placebo effect, said Paul, who noted that over the last 10 years, he has consulted for many of the manufacturers of these medications, and carried out studies funded by them. Studies have not shown that cough suppressants help children cough less, or that antihistamines and decongestants help them sleep better. 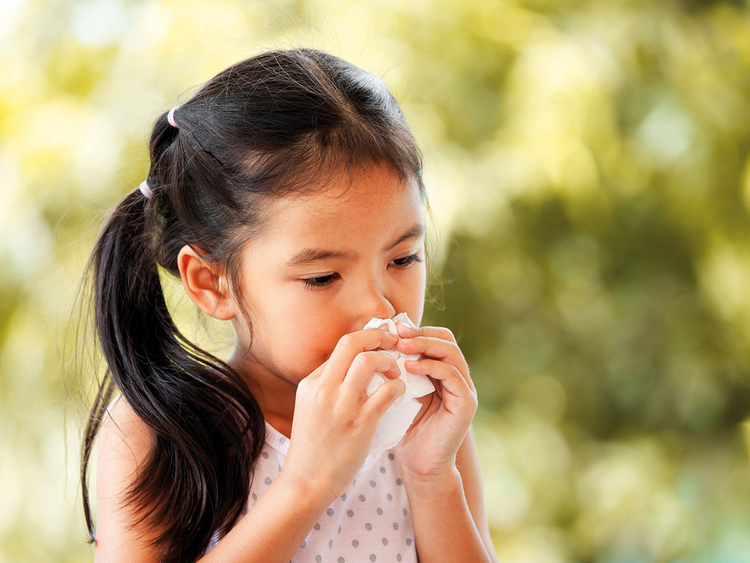 Medicines that can help a child with a runny nose from seasonal allergies won’t help that same child when it’s a cold virus making the nose drip; the underlying mechanisms are different. “In my own practice, I reassure them, I check the child, I make sure I’ve covered the ears, the lungs, the throat,” Van Driel said. “I reassure the parent: This is a cold, a cold is a self-limiting disease, we have capable immune systems that will take care of it, it will take about a week.” People need to feel confident in their bodies, she said, instead of relying on medicines. “I would tell them, there’s not a lot we know that helps. Don’t give him anything you might give your older child or take yourself,” Van Driel said. And, of course, we always tell parents what to watch out for, symptoms that might suggest that something more than a cold is going on. Any respiratory difficulty in a child has to be taken seriously, so a baby who is breathing too fast or a child who is working harder than normal to breathe should be checked out. High fevers are concerning, as are any of the signs of influenza, such as shaking, chills and body aches; influenza in children can be treated with antiviral drugs — and prevented with flu shots. Children with the “common cold,” on the other hand, should generally be able to eat and drink, should be alert and able to play — or, at least, susceptible to distraction. “It’s unfortunate because the illnesses are so common, young children and babies suffer, parents miss work — but we’re no further along than we were 60 years ago,” Paul said. “We still don’t have good therapeutics for the common cold.” So read stories, bend the screen time rules, boil up the chicken soup.